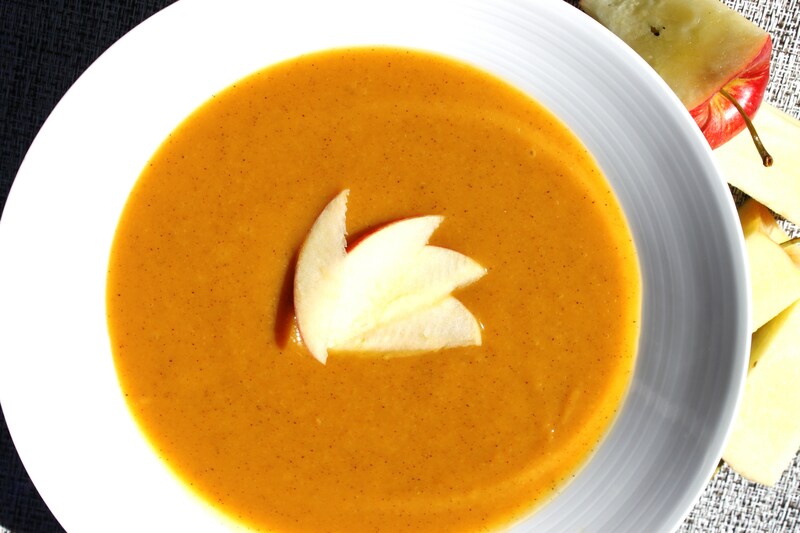 Local butternut squash and a day of apple picking inspired me to combine the two in this delicious soup. (That and the fact that as soon as Fall arrives I have the urge to make soup; it’s just so warm and comforting). There are a variety of spices you can add to this soup depending on your tastes, but for this one I chose cinnamon and nutmeg. Mainly because I know my kids like those ones, but I also think they just compliment the squash and apples well. Heat a large saucepan over medium heat and melt the butter. Add the chopped onion and cook stirring occasionally until it softens. Add the chopped squash and cook until soft (about 10 minutes). Add the apples, salt, cinnamon, nutmeg and stock. Then add water just until the mixture is covered. Bring to a boil and then reduce the heat and let simmer stirring occasionally until the squash and apples are soft (about 25-30 minutes). Puree the mixture in a food processor blending until smooth and creamy. At this point you can add more water a little at a time for desired consistency. Serve in bowls topped with thin apple slices.